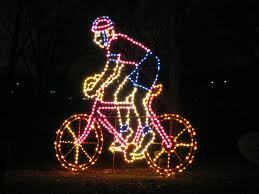 Holiday Spin Class: 12/19/2012 @ 6:00 p.m.
Come celebrate the holidays with friends & work off some winter weight at Cycling Adventures Holiday Spin! Work out will last approximately 90 min. Bring your bike, a trainer,a small towel and a toy or $10.00 gift card to donate to AJ's Kids. Appetizers & Beverages provided after class.